From the capital of A Terra Chá, to the small hamlet of Miraz-which hardly qualifies for a small dot on the pilgrim map, except for its albergue- the route does not pose any difficulties aside from the distance between both locations (33 kilometres). Vilalba, Guitiriz, Begonte, Guitiriz once again and, Friol are all passed on route. Afterwards, walkers arrive at the albergue of Baamonde (Begonte), one of the accommodation establishments with the highest capacity on the Northern Way. The stretches of this stage are well signposted and in general run along earthy tracks and cement roads with some stretches shared by the N-634 and the N-VI roads. The numerous bars and restaurants situated at the edge of the national roads make finding supplies an easy task, although there is some distance between each one, in the majority of cases, by a handful of kilometres. Having spent the night at the public pilgrim albergue, the day begins one kilometre away from the urban centre. In the centre of Vilalba, here walkers will find all the services they might need. Without deviating from the main street of rúa da Pravia, they will also find the defensive tower of the Counts of Andrade, now converted into a Parador hotel and, the church of Santa Maria. The route then crosses the river Magdalena via the bridge Ponte dos Pasos, next to a mill. 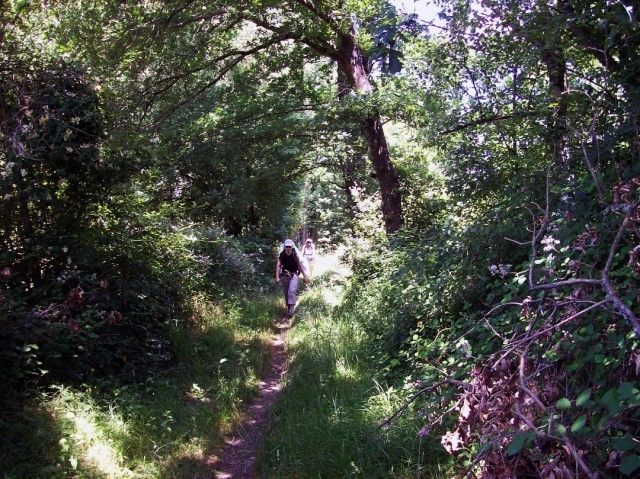 After passing close to the A-8 motorway hikers will reach the medieval bridge of Ponte Rodríguez, over the river Trimaz, under the shelter of oak, alder and birch trees. From here the route passes the parishes of Boizán and Alba and the church of San Xoán of Alba. ATTENTION AT THIS POINT! Many pilgrims make the mistake of continuing the route next to the church, when the correct Way is to continue on the national road to then take a turn off to the right some hundred meters after. Close to the junction where the temple is situated, just a short walk in fact, the café bar Casa Cascudo is situated. This is the first establishment passed by walkers in the first five kilometres of this stage, therefore, a stop here is likely. This bar also has a small grocery shop and serves a menu of the day. In A Torre (26 kilometres to Miraz) hikers will find the café bar Alejandro (sandwiches for 2-3 euros). Afterwards the medieval bridge of Saa is reached. In the Council of Guitiriz, at the edge of the national road, there is a bar and a casa de comidas (an informal restaurant, generally with economical prices and traditional home cooked food): A Revolta. From here the route crosses the N-534 road and passes below the A-8 in the location of Ferreira. 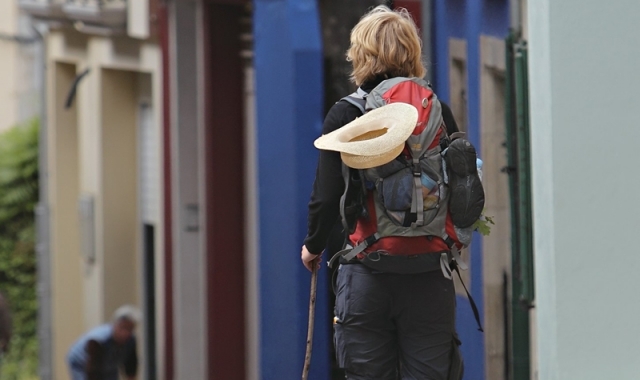 At this point walkers should take extra care because the Camino runs along the national road for almost two kilometres, until taking a turn off to the left along an earthy track. Hikers pass the council of Begonte, via the locations of A Rega and Baamonde, (15 kilometres from Miraz and 41km to Sobrado). Apart from the albergue there are restaurants, bars, a supermarket, a chemist, taxis and a bank, among other services. At the exit of this location there is a service station, it has a restaurant and a Hostel (La Ruta Esmeralda), alternative accommodation, in the case that the albergue is full. The national road is abandoned via a turn off to the left, crossing the railway line and a gothic bridge over the River Parga which allows passage to an ideal place: the Sanctuary of San Alberte. A rest at this point would not be a bad idea. The route then climbs upwards from the sanctuary on a cobbled stone path with large stones positioned in the form of steps, which without doubt will force cyclists to dismount. In Eirexe, pilgrims will find a hotel situated some 250 metres from the Jacobean route; the hostel/albergue Deva Natural-Mente (a double room with breakfast, 15 euros). Continuing on hikers pass the locations of Caínzos, Digañe and, Raposeira, in the direction of Carbelledo (6 kilometres to Miraz), where Apoyo al Peregrino (a pilgrim help point) is situated. There is also a charming rustic café bar where travellers can purchase provisions and have free Internet access. The next location, Aldar, will surprise walkers with local craft stalls dedicated to the pilgrimage (peregrin@rte). Walking sticks, scallop shells, staffs and, handkerchiefs can all be found. In the recreational area of Sesión, there is another bar (Mesón O Cruceiro) in front of the cross. A few meters after, now down hill, is bar Reche, the last one until the nearby hamlet of Miraz. 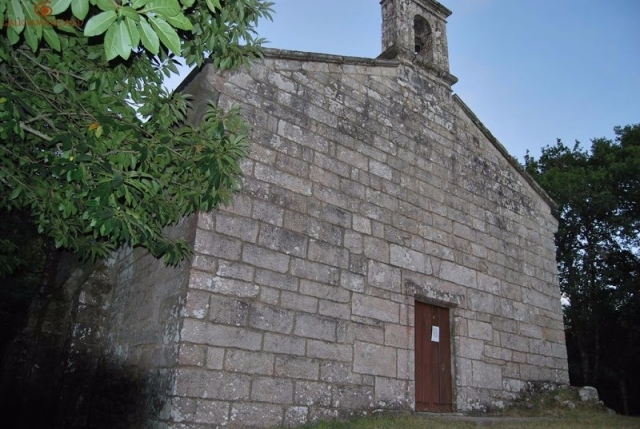 After the bridge of Leixoso, the albergue of Miraz is reached (25 kilometres to Sobrado), managed by volunteers, generally British and members of the confraternity of Saint James. There are no other services apart from the bar Parada. Only a few stretches will cause problems for cyclists. The most complicated of them is the stretch that connects the chapel of San Alberte to Baldoncel (Guitiriz). The alternative route is to continue on the asphalt road-before the earthy track that leads to the sanctuary-until arriving at the yellow arrows which direct back to the itinerary. The alternative to the previous stretches is via the N-634 or the N-VI until reaching Parga. Etapa 30 Vilalba -Baamonde , Baamonde -Sobrado etapa 31.Desde Baamonde hay poco más de 100 km a la Plaza del Obradoiro, son los km mínimos para conseguir la COMPOSTELA , Y por eso Baamonde es punto de salida de muchos peregrinos. 1 reviews Distance to Santiago: 120 km. 1 reviews Distance to Santiago: 87 km.